The obvious sellers in the East are the Hawks, Knicks, Bulls, Cavs, and Magic who have had a bad month and are falling out of the playoff picture. Not so obvious are the Celtics and Pacers, the former who may be looking for addition by subtraction and the latter who really like Aaron Holiday and may be looking to see what they can get for Darren Collison or Cory Joseph. Nobody knows what the Wizards will do. The Nets might also have a player or two that they will move if they get the right return. Yes, I am looking at you DeMarre Carroll. The Nets can afford to let Carroll go, since Rodions Kurucs is playing well, Rondae Hollis-Jefferson, Allen Crabbe, and Caris Levert are coming back. The Nets might also see if they can get back a little more than a 2nd rounder for Shabazz Napier should a contender want a backup PG. With D’Angelo Russell, Spencer Dinwiddie, and Caris Levert all showing playmaking and closing ability, he is a little extraneous. The buyers include the Pistons, Hornets, and Heat. The Hornets would love a playoff experience for their loyal fans, their impatient owner, and for Kemba Walker. The Pistons and Heat also want to make the playoffs. The Celtics and Sixers want to avoid the dreaded fifth spot—which could pit them against the other without home court advantage. A first round exit would be bad PR for either franchise. So, who might be moving? From the Hawks, there is a dealer’s choice of prospects. Need a 3-and-D wing (doesn’t everybody)? Then Kent Bazemore is your man. Want a shot blocker who can shoot from downtown? Try Dwayne Dedmon. If you need a backup PG who can score and be a playmaker, then add Jeremy Lin (Linsanity) to your shopping cart. If you own any of these three, I would try to get what I could for them. Any move elsewhere will result in a backup role for a contender, reduced minutes, and numbers. However, if you are looking for a late season boost, the outlook for those left behind, DeAndre Bembry, Kevin Huerter, Alex Len, and Taurean Prince brightens considerably. The Bulls are hoping somebody will take Jabari Parker off their hands, but I am not sure any team will bite, unless they are able to offload an onerous contract. Parker to the Knicks for Enes Kanter gives Parker a half season audition to let the Madison Square Garden faithful realize everybody was wrong about him and rids the Knicks of the unhappy Kanter. Luke Kornet and Mitchell Robinson, especially Robinson, (if you need blocks, I would go get Robinson now) are the beneficiaries of any Kanter move. The Bulls have already jettisoned Justin Holiday. Parker and Robin Lopez may follow. Lopez would love to play the role Tyson Chandler plays for the Lakers in Golden State yellow, but the Warriors don’t want to give anything up for him, hoping the Bulls will just get tired and buy him out. While we are talking about the Bulls, rush out and add Chandler Hutchinson. Wendell Carter Jr.’s season-ending injury frees considerable minutes for the rookie forward. One of the bigger prizes of the trade deadline could be Kevin Love, but most teams want to see him play before they begin discussions. Love also carries a 4-year, $120M price tag. 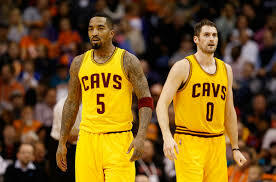 The Cavs would take a 2nd rounder and a bag of balls if they could get it for JR Smith. A week of tumbling in the standings may make some Western team desperate enough to pay, when every win is gold for those fighting to play past April. Another trade candidate could be Magic center Nikola Vucevic, who is having an All-Star season and could help any playoff hopeful. The Magic could hope to resign him, but he could also walk without getting any compensation. His value is sky-high, so the Magic could certainly get something for him now. Mo Bamba and Jonathan Issac, both in need of weight gains to handle the NBA physicality, would instead eat Vuc’s minutes. The Magic will also entertain offers for Terrence Ross and Jonathan Simmons, and expect at least one of them to have a new address, maybe New Orleans. If Ross is still in Orlando come Valentine’s Day, I will be surprised. Tim Hardaway Jr. is also available, but he gets a hefty check, which any team would have to cover, so the benefit would have to be obvious to make that move. Allonzo Trier and Damyean Dotson become the beneficiaries if Timmy Jr. is traded. Cool your heels if you are hoping your team will swoop in and swipe Bradley Beal from the Wizards. I can’t see that happening. What I can see happening is Trevor Ariza moving again. I am sure the Rockets would love to figure out a way to correct the mistake of letting him get away. Because of the collective bargaining agreement, Trevor would have to be moved in a one-for-one deal, so the other player will have to be close salary wise. Kentavious Caldwell-Pope might be a good match. The Lakers might want a veteran for their playoff push and they coveted Ariza earlier. The Sixers must get a player to add to their mix – and have some draft picks to dangle. They need something akin to what they added last year with Ilyasova and Bellinelli, bench scoring and long-range shooting. If they don’t add someone, keep your eye on Landry Shamet, who is getting more confident by the week. They would love to send Markelle Fultz somewhere and get a player they can use now. If they could package Wilson Chandler with Fultz that would be a bonus. If Chandler moves, check out Jonah Bolden, who already ate Amir Johnson’s minutes, is snacking on Mike Muscala’s time, and seems hungry for more. In the West, the sellers are few. The Suns, Grizzlies, and Mavericks are close behind. The Pelicans are in a terrible spot. They should be sellers, but with Anthony Davis’s free agency looming after next year, they have to prove they are trying to win in order to keep him. Look for them to sell their first rounder again in hopes of having lightning strike twice. Last year, the addition of Nikola Mirotic sent them on a hot streak that continued right into the second round. There is not another magic pill like that out there, and nobody is really interested in taking overpaid Solomon Hill. To make matters worse, the Unibrow is out for a while with a bad finger. Jump on Jahlil Okafor, as he will score and rebound. He won’t stop anybody on the defensive end, but the Pels pray they can win enough games to not fall completely out of contention until AD comes back. What do the Suns have that anybody wants? Some teams may be interested in sharp-shooter Troy Daniels, but the Suns will try to attach Ryan Anderson to any deal. They have TJ Warren, Josh Jackson, Kelly Oubre, and Mikal Bridges, which is probably three more young small forwards than any team needs, but they would have to choose which one to let go – which could easily end up being the wrong one. The Kings will certainly factor into the trade deadline conversation. With a bevy of young players coming into their own, and available cap space, they can afford to take on a contract that smells a little if it buys them some draft capital to add more young talent. Zach Randolph will more than likely be sent somewhere, and Harry Giles is playing more and more, and his oft injured knees are looking steadier and steadier. Kosta Koufas may also be a player they move if someone needs a backup big. The Rockets will also certainly do something, but I am not sure what. They are targets for Bazemore, KCP, Ariza, Carroll, Wes Matthews, or any 3-and-D wing they can muster, including talking Richard Jefferson or Sean Elliot out of the announcement booth. The Blazers must know they need an upgrade at the forward positions. The Clippers and T-Wolves may become sellers if the next 10 games are not kind. A 2-8 stretch in the West will end playoff chances quickly, just ask JB Bickerstaff. If the Mavs could take a few games and feature DSJ, and thus convince the Magic that he can put them back in the Eastern playoff hunt, they will try it. That would kill DJ Augustin’s value. Maybe a DSJ for Vucevic swap could happen if the Mavs are convinced they could sign Vuc. 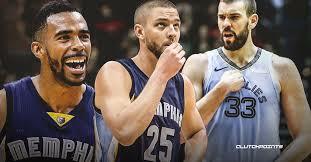 The Grizzlies are entertaining offers for Conley and Gasol, but this is complicated by Gasol’s $25.6M player option next year and Conley’s contract which pays him as much as $34.5M for the 20-21 season. A GM would have to have a really big jar of Tums to take those plunges, since Gasol is 33 and Conley 31. If they do get moved, and I have a hard time seeing a landing spot, Shelvin Mack, JaMychal Green, and whoever they get back are in for some big minutes. The Grizzlies would love to attach Chandler Parson’s contract to any move but that just makes it more difficult. Michael Alex Conley Jr., the son of Olympic triple jump gold and silver medalist Mike Conley Sr., has been providing great play for the Grizz since they drafted him fourth overall in the 2007 draft. For several years, he wore the tag of “best player never to make an All-Star team,” as the West was crowded with talented point guards. He and Greg Oden led Ohio State to the NCAA championship game as freshmen in 2006, losing to the Al Horford, Joakim Noah, and Corey Brewer Florida Gators. An original member of the “Grit and Grind” crew, even if he wears another team’s colors, he will always be remembered as one of the players that brought a tough-minded style to the Beale Street Bears. Other names that are possible trade candidates are Derrick Favors, Terry Rozier, Wayne Ellington (every team can use a shooter of his ilk), Courtney Lee, Lance Thomas, Noah Vonleh, or any Knickerbocker not from Latvia. 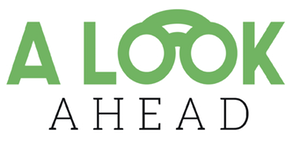 Watch the trade news and consider who gets left behind after trade deadline moves so you can swoop in and add a new contributor to your team. Enes Kanter lately has been hortatively telling the New York Knickerbockers, play me or trade me, and I believe the organization will accommodate his wishes. I understand the logic of dealing Harden high, but man oh man what a run he has been on. Hate for it to continue even close to what he has been the last month and you give it away. Good stuff. Mirotic in my IR slot. Tristan news means he may have to go in a 12 team, h2h league. Who would you replace him with? Mamba, Bismack, Vonleh, Nance, Faried. Seeking blocks and FG% without killing my ft %. 1. I picked up Okafor for the week and he has been a pleasant surprise. Is there a chance he plays alongside AD later or is he toast next week? 2. Please rank top two waiver adds from this group (my team below)…and who are my drops? it is hard to rank them not knowing what you need and where you stand in your league, but it looks like you are stronger in guards than bigs, and knowing Okafor is a short term play you might lean towards the bigs — Vonleh has been consistently good, McGee still productive in limited minutes, and Bamba the upside play if Vuc gets traded. D White looks locked in with the Spurs for the rest of the season, with good overall production, Huerter looks good for threes and points especially if Baze, Lin or Prince get moved, but the FG % is an issue. Second place in 12 team, H2H league. Only 2.5 games back with a favorable schedule so a bye seems likely. With the news that AD’s agent finally announcing AD won’t resign with the Pels, I think I need to hold Okafor now. I dropped PJ for White last night as well. Okafor may be a big contributor if they move AD before the deadline.